It is important to remember that the funeral service is not provided for the deceased – but rather to support and comfort the living. In fact, most psychologists agree that a funeral service is the best way of bringing closure to a life that has been lived. It not only helps family and friends move ahead with their lives following a loss, but it also serves as an opportunity to celebrate the life of a loved one. The funeral service allows family and friends to find strength and comfort by gathering together and sharing memories and special times with one another. Gathering at the service allows everyone to be included in the grieving process and most importantly, allows the immediate family to begin the healing process. Funeral services can be wide ranging from contemporary to traditional and from religious to secular. Music, scripture, poetry, shared memories, stories and video tributes can be added to make the service unique and memorable. 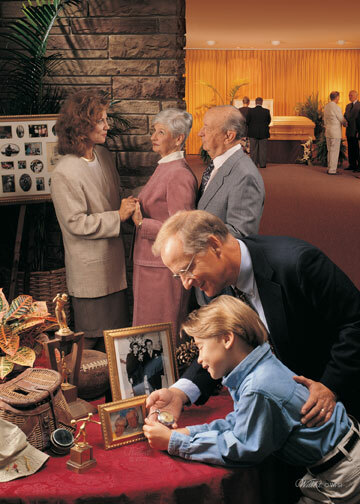 Oftentimes, families choose to set up a table with personal items and pictures that help acknowledge the accomplishments, interests and personality of the individual. All of these ideas add meaning to the service or ceremony and help everyone to share in this special time. Our funeral directors will be glad to assist you in planning the type of service you desire.